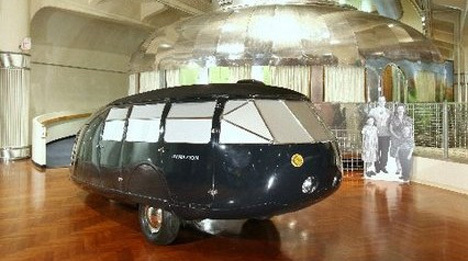 In 1933, the Dymaxion car was meant to be the crown jewel in wacky designer Buckminster Fuller’s catalog of inventions. The oddly-shaped vehicle featured three wheels (two in front, one in back), measured in at 20 feet long and could carry 11 passengers easily. And along with its bizarre body and excellent performance, it was meant to fly in future iterations. It was going to be the next big thing in automotive design. Sadly, a fatal crash in one of the three prototypes effectively ended the future of the Dymaxion and a lone prototype was all that was left to show for all of Fuller’s vehicular dreams. Now, almost 30 years after Fuller’s death, famed British designer Norman Foster is reviving that dream and bringing the Dymaxion back – at least in part. Foster recently won a design contest to remake the beloved London Routemaster bus, making him something of an expert in bringing dated but iconic vehicles into the limelight. As a tribute to the late Fuller, he built a fourth Dymaxion using the only remaining original prototype (pictured above) and notes from the Buckminster Fuller Archive at Stanford University as references. The newest version of the Dymaxion – affectionately dubbed “Dymaxion Number 4” – was lovingly crafted in the UK by racecar restorers Crosthwaite & Gardiner. According to the restorers, building the resurrected Dymaxion required forgetting everything they previously knew about automobiles. Foster’s intentions with the project seem only to be focused on drawing attention to this long-admired design; the newly-minted car is traveling in an exhibit of Bucky Fuller’s work. But who knows what the future could bring for this historic vehicle that never got off the ground? 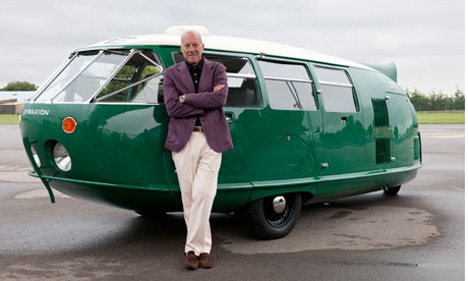 Perhaps a renewed interest in the unique car will encourage a brave automotive company to take a look at the possibilities of the Dymaxion.